Python and Scratch are by far the most popular options for programming Raspberry Pi. With a bit of work, however, you can teach Raspberry Pi to understand other languages, including PHP. You might want to use PHP on Raspberry Pi for several reasons. If you've already built a PHP-based app, and you want to integrate it with Raspberry Pi, for example, it makes sense to stick to PHP. Perhaps you are more familiar with writing code in PHP than Python, or maybe you just want to give another programming language a try. Probably the easiest way to use PHP with Raspberry Pi is through the shell_exec() function. This function lets you execute shell commands, so it can act as a sort of bridge between PHP and the Raspberry Pi. In the most simple case, shell_exec() can call Python scripts that perform certain tasks and control GPIO pins. To make sure Wiring Pi is installed and works properly, run the gpio -v command; it should return the current version of Wiring Pi along with the basic Raspberry Pi info. Next, execute the gpio readall command to view a detailed GPIO layout diagram. To put Wiring Pi to practical use, I'll build a super-simple PHP app for controlling an LED. Connect an LED with a resistor to GPIO pin 17 and GND as shown in Figure 1. Open the terminal on your Raspberry Pi (or connect to it via SSH) and switch to the /var/www directory. Then, use the sudo nano gpio.php command to create the gpio.php file for editing. Place the code in Listing 1 (adapted from the Raspberry Pi Tutorials website ) in the file. Figure 1: LED wiring diagram. The key element of the app is an HTML form containing ON and OFF buttons. When you press one of the buttons, its value is passed as a part of the URL (gpio.php?on=ON and gpio.php?off=OFF). GPIO pin 17 is controlled by PHP code that uses the shell_exec() function. The statement in line 13 sets the mode of the pin to out; the code block in lines 14-21 reads the current value from the URL and uses the shell_exec() function to turn the pin on and off. 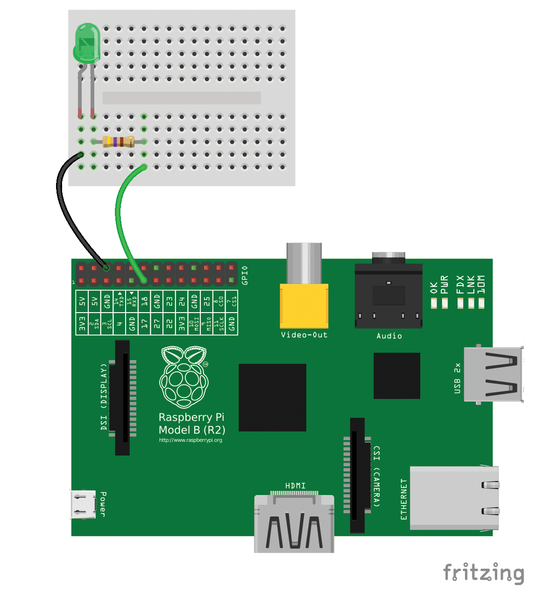 Now, point the browser to http://127.0.0.1/gpio.php (replace 127.0.0.1 with the actual IP address of the Raspberry Pi) and use the buttons to turn the LED connected to the Raspberry Pi on and off (Figure 2). Figure 2: Behold the simple PHP app in all its bare-bones glory. Also, make sure that the /var/www directory belongs to the www-data user and group (use sudo chown -R www-data:www-data /var/www to set the correct owner). Even this very simple PHP app can be put to several uses with a minimum of tweaking. For example, I use a simple transistor switch connected to Raspberry Pi to control my film SLR camera . The original solution used a simple Python script to control the switch. To run the script, I had to do this via an SSH connection, which wasn't very practical in many situations. So, I modified the example PHP script for use with the transistor switch (Listing 2). All I had to do was remove one of the buttons and modify commands in the if condition to turn on the switch, wait for 0.5 seconds (so the camera registers the signal), and then turn off the switch. Now, I can use the PHP app to trigger my camera from any computer and mobile device. The first sets the pin's state to 1 (i.e., turns it on), and the second changes the state to 0 (i.e., turns the pin off). Finally, the $gpio->unexportAll() command resets all pins. Using these commands, you can quickly whip up a simple PHP script that blinks the LED connected to GPIO pin 17 (Listing 3). To run the script, execute the sudo php blinking_led_script.php command. Although the php-gpio library makes it easy to control GPIO pins from PHP scripts, keep in mind that the scripts themselves must be run from the command line. In other words, you cannot use the described commands directly in PHP pages served by a web server. The solution is simple: Use the shell_exec() function to call the script from a PHP app. For example, I run a simple PHP-based photo gallery on my Raspberry Pi, and I have added the shell_exec('sudo php path/to/php-gpio/blink_led.php') statement that calls the blink_led.php script. This way, when someone visits my gallery, the LED blinks for a couple of seconds. Again, because all PHP scripts on Raspberry Pi must be run with root privileges, you need to add the www-data user to the sudoers file. The php-gpio library can be put to other, more advanced uses, too. The php-gpio-web GitHub repository, for example, contains a simple web app  that demonstrates how to create a web interface to control an LED, and the temperature-pi project  shows how to read and log data from a temperature sensor. In this article, I briefly outlined the possible approaches to using PHP on Raspberry Pi. And the example scripts offer a few pointers on controlling GPIO via PHP scripts. So if you want to use PHP with Raspberry Pi, you now know where to start.